The Beyond Standard Model group at DESY is involved in several searches with jets and missing transverse energy in the final state. The main goal is to test models which predict Dark Matter, Dark Energy, Supersymmetric particles, extra Higgs bosons or other new phenomena in LHC collisions. Supersymmetry (SUSY) is an extension of the Standard Model (SM) that can resolve, for example, the gauge hierarchy problem by introducing supersymmetric partners of the known bosons and fermions. The SUSY partner to the top quark, the top squark, plays an important role in cancelling potentially large top-quark loop corrections in the Higgs boson mass. In most common SUSY models, the supersymmetric partners are produced in pairs and the lightest SUSY particule is stable, providing at the same time a candidate particle for Dark Matter. Top squarks are produced by strong interactions through quark–antiquark annihilation or gluon–gluon fusion and the cross section of direct top-squark pair production is largely decoupled from the specific choice of SUSY model parameters. However, the decay of the top squark depends on various parameters. 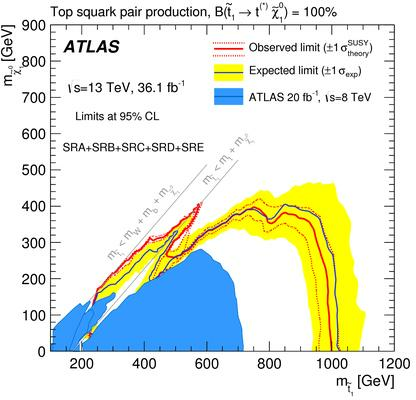 The DESY ATLAS group is involved in searches for top squark pair production considering various scenarios for the top squark decays. Postulated more than 80 years ago by F. Zwicky, the phenomenon of dark matter is still one of the major unsolved questions in today’s science. While its existence is firmly established by a multitude of astrophysical and cosmological observations, such as measurements of the rotational velocity of galaxies and, more recently, the cosmic microwave background, its nature remains elusive. Assuming dark matter is a so-called weakly interacting massive particle (WIMP) it could be produced at the CERN Large Hadron Collider (LHC). 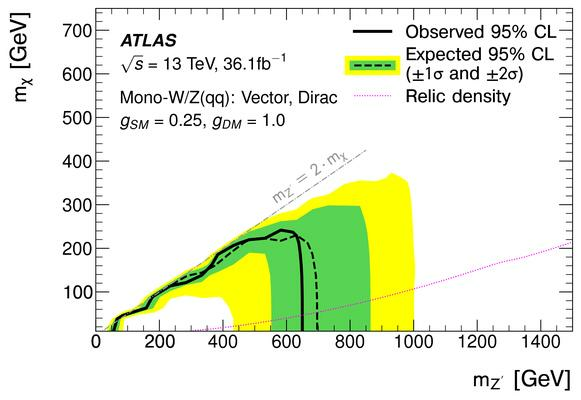 The ATLAS group at DESY plays a leading role in searches for dark matter at LHC. Recently proposed simplified benchmark models for dark matter (DM) searches at the LHC extend the particle content of the Standard Model (SM) by fermionic DM and a mediator particle connecting DM and SM particles. Some of these interesting models involve scalar (CP-even) and pseudoscalar (CP-odd) couplings to SM particles. Assuming Yukawa-like couplings for such (pseudo-)scalar mediators, the coupling strength scales with the mass of the SM fermion and is largest for the heaviest known elementary particle, the top quark. WIMPs would not leave any signal in the detector. Their production would be detected as a large amount of missing transverse momentum recoiling against visible particles, such as a top quark–antiquark pair, due to momentum conservation. 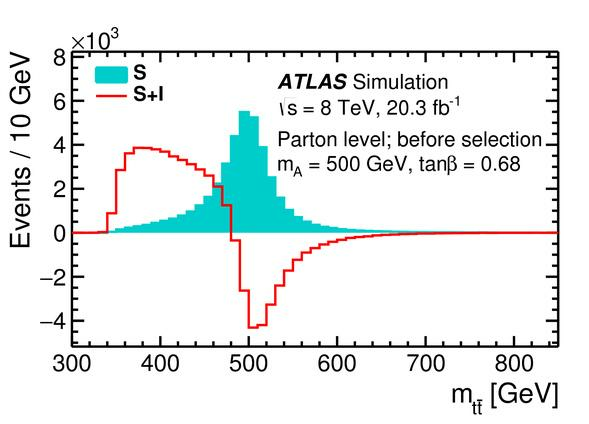 The ATLAS group at DESY plays a leading role in searches for a data excess in LHC proton–proton collisions with ttbar pair and large missing transverse momentum. Our group is also working on a search for dark matter pair production in association with a W or Z boson in pp collisions. Events are characterized by large missing transverse momentum and a hadronically decaying vector boson reconstructed as either a pair of small-radius jets, or as a single large-radius jet with substructure. To maximise the search sensitivity, several orthogonal selections were derived to target different signal signatures. These are complemented with various control regions in order to minimise the uncertainty on the irreducible backgrounds. 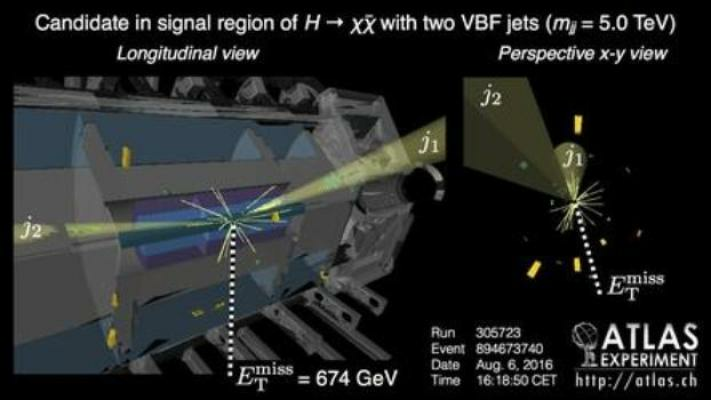 Additional, heavy Higgs bosons are predicted in numerous extensions of the Standard Model, in particular so-called two-Higgs doublet models (2HDMs), such as supersymmetry or various simplified dark matter models. If they are heavier than twice the mass of the top quark (ttbar), the heavy Higgs bosons predominantly decay to a top-antitop quark pair for a large range of possible configurations of the two Higgs fields. Until recently, searches for ttbar were not sensitive to these types of decays due to the strong interference between the signal and dominant background processes that occurs in the case of scalar and pseudoscalar resonances. These interference effects lead to a non-standard signal shape: instead of a local excess ("peak") a "peak-dip" structure is expected. 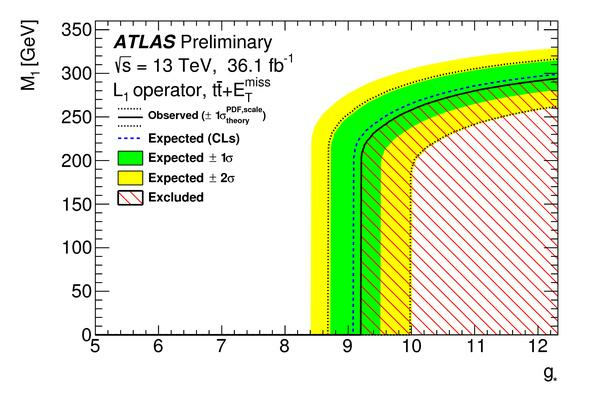 The DESY ATLAS group has performed the first search for heavy Higgs bosons decaying to ttbar, taking account these interference effects. This search probes, for the first time, a previously unexplored region of the 2HDM parameter space. models, no single prevailing model has been identified so far. 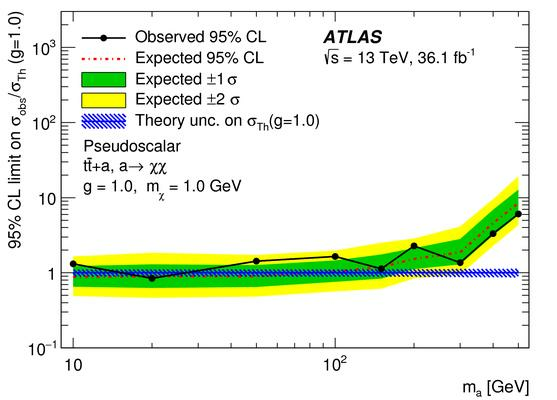 Collider experiments offer a unique environment to search for the direct production of DE particles, should they exist, since they are sensitive to a multitude of signatures and therefore to a wider array of possible DE interactions with matter. An Effective Field Theory (EFT) framework provides an economical way to describe DE, since it integrates out the microscopic dynamics of the DE interactions, which are completely unknown. The ATLAS DESY group is involved in searches for Dark Energy through effective interactions.